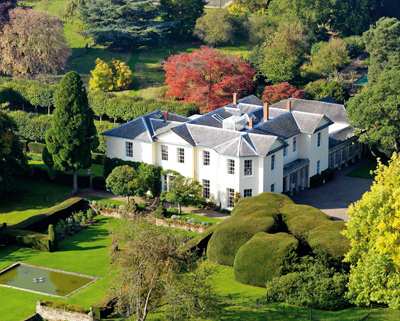 Few Shropshire estates ever come up for sale, so next week’s official launch in Country Life of the enchanting Chyknell Hall estate at Claverley, six miles east of Bridgnorth and a mere 22 miles from Birmingham, will lay down a marker for the rest of the year. Carter Jonas (020-7493 0676) and Savills (020-7409 8823) quote a guide price of £6 million for Chyknell, which is for sale for only the second time since 1209, having passed continuously by inheritance before being bought by its current owner, Simon Kenyon-Slaney, in 1968. According to county records, the Chyknell estate was owned by the de Checkenhull family from 1209, later passing by marriage to the Farmer and Taylor families. In 1706, Sarah Farmer inherited Chyknell and married John Taylor of Oldbury, near Bridgnorth. In 1811, Taylor’s grandson, Frederick Farmer Taylor, inherited the estate and commissioned Shrewsbury architect John Haycock to build the present Chyknell Hall on the site of a much older house. The substantial Grade II-listed stable yard, dated 1792, was evidently part of this earlier complex. The upwardly mobile Farmer Taylor was appointed High Sheriff of the county in 1815 and, a year later, married the Hon Juliana Cavendish, daughter of Richard Cavendish, 2nd Baron Waterpark. In 1852, their son Henry inherited the estate, and, in 1858, commissioned John Haycock’s son Edward to make extensive alterations to Chyknell Hall, including the addition of a grand new dining room and a striking Greek Doric colonnade in front of the central service wing. together, walking down the drive and leading Moseley’s horse. A year later, Selina and Henry were divorced. In 1893, Chyknell passed into the Cornwall-Legh family when Henry and Selina’s heiress daughter, Edith Selina, married Col Hubert Cornwall-Legh of High Legh Hall, Cheshire. She died in 1949, leaving the estate to a stockbroker cousin, Maj Edward Gage, who immediately commissioned a number of designs from Trenwith Wills for further alterations to the house, which included the conversion of Edward Haycock’s dining room into a handsome library. and Mrs Kenyon-Slaney have ‘concentrated on maintaining the structure of the house and buildings, decorating but avoiding any serious structural changes’. Elegant Chyknell Hall has some 14,800sq ft of living space on three floors, including four fine reception rooms, an impressive cantilevered staircase, plus a kitchen/breakfast room, study and domestic wing on the ground floor; master and guest suites, seven further bedrooms and three bathrooms on the first floor; three bedrooms and a bathroom on the second floor; and a two-bedroom first-floor annexe. Shropshire boasts some of the most spectacular landscapes in England, and delightful, 18th-century The Vineyard near Weston-under-Redcastle, 13 miles north of Shrewsbury, stands in one of the most dramatic of them all. Protected by a wooded sandstone escarpment on the slopes of the Hawkstone Hills, the house, listed Grade II, is surrounded by Hawkstone Hall to the north, the celebrated, Grade I-listed Follies parkland to the west, the Bury Walls Iron Age fort to the south, and the famous gardens of Hodnet Hall to the east. The house and folly-the latter now a romantic ruin-were built in the early 18th century by Sir Rowland Hill as part of the aggrandisement of his expanding family estates, which were visited by royalty in 1748. The parkland is part of a masterpiece of the English Natural style, considered to be on a par with Blenheim, and, according to an article in Country Life of May 1985, every bit as memorable as the Orsini gardens in Italy. Following the break-up of the estates by Lord Marchamley in 1925, the house, its terrace and parts of Rake Park, a magnificent former deer park, passed into outside hands. Current owners Mark and Christine Dunford bought The Vineyard in 2006, but are now selling in order to downsize, as their children have flown the nest. Strutt & Parker in Shrewsbury (01743 284200) quote a guide price of £1.55m. Built of rendered brick and stone under a slate roof, The Vineyard radiates comfort and charm. Located at the end of a long private drive, it has a tidy 3,912sq ft of internal space, including five reception rooms, a kitchen/breakfast room, a conservatory, five bedrooms and three bathrooms. The gardens include a series of lawns, ponds and ornate stone terraces, with woodland walks offering exceptional views and total privacy. Equestrian facilities include a purpose-built stable yard, a large hay barn, two winter paddocks and a floodlit outdoor manège.